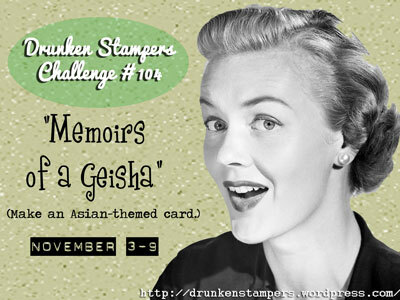 This week's challenge on the Drunken Stampers Blog is Memoirs of a Geisha....an Asian inspired challenge. Be sure to check out the blog (click above) for all the details on this challenge and to see all the projects created by Team Flirtini this week. I knew right away I wanted to use either the Symbols of Solitude or Kanji stamp sets for this challenge. They are retired sets from SU but have always been two of my favourites. I used a Versamarker on the stamps for the card base to get the script only and not the text underneath. I really like the way the Raspberry Ripple looks with the black and white.